Tip #1 - Go as low as you can on the roof when a hawk is in the area. Please note that the tail must also be flattened out as to not give yourself away. 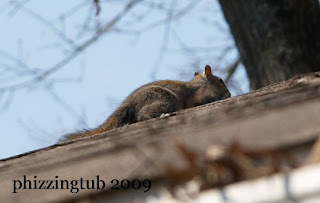 I was amazed at how flat this squirrel was able to get, seriously I have never seen one that low before. As soon as the hawk was done flying over the house it scurried up a tree out of sight.